Discussion in 'Classic Menswear' started by nutcracker, Apr 4, 2013. Those in Tokyo, come to the World Championships in Shoemaking event at Isetan Men's this Saturday October 6 between 3-7PM. I will be there together with the world champion Patrick Frei, top three shoes in the contest will be exhibited, as well as the four best Japanese makers' entries. More info here on Isetan's website. Picture from Unipair in Seoul when the podium shoes were exhibited there, on their ongoing world tour. I didnt know any of those but they look great! I may have found a new Japanese bespoke shoemaker. Today, I took a pair of jeans to Sarto in Ginza to be shortened, and to have the hem of a jacket mended. While I was waiting for them to write me up, I spoke with Yutaka Moriguchi. Apparently, Mr. Moriguchi apprenticed with Hiro Yanagimachi. He does pattern order, made to measure, and full bespoke. He also makes belts and other leather goods. He will also resole bespoke shoes with a hand sewn welt. I don't know how that would work out without the original last. I was just thinking he might have opened his own business after leaving hiro, when I saw the news on instagram, would you happen to know his pricing? EDITED: was using my phone and didn't realize you provided a link. thank you! Didn't realize there was a link - thanks! My Dark Brown punched Captoe from Joe Works arrived last week. They’re even nicer in person compared to the pictures on their Instagram. I was concerned since I have somewhat of a high instep but they fit well and the “V” is not really wide at all. I’ll post some fit pics some other time. Where did you order your MTO from? From www.thesabot.com. Fantastic service and quick. Joeworks Last 0. 3 eyelet chukka boots. 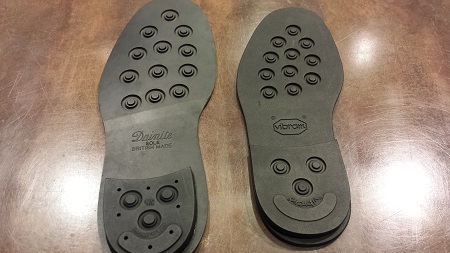 Vibram sole. I placed an order in Tokyo when I visited their workshop in mid Jan. The shoes was completed almost exactly after 2 months. It is very quick for some of us who are used to some of European maker's MTO. The first picture was taken immediately after out of the box. 2nd and 3rd pic were after 1 day wear and polishing. I applied neutral cream first and buffed, then used blue shoe cream and applied black wax. Leather quality looks quite good. It creases naturally and quality is constant through out the pair. Level of craftsmanship is high and they are very cleanly made. Sizing: I take the same size as Gaziano and Girling and fitting is quite good for me. Toe box area is less roomy than GG. There were metal eyelet on the back of the facing, I may go without those if possible from next time. Sometimes the metal is visible from certain angle and I am not a fan of it. @vriche was this a GMTO or just a one off? Also, any surcharge on going MTO? would be curious if Sabot had more offerings one could utilize going that route. It was a one off. I’ll send you a DM.